In 1991, Mike Dunn was newly married with a job cleaning dog kennels when he dropped into the Devine Paint Center store looking for work. Apparently, Devine owner Robert McAdams liked what he saw. The two clicked, however, and Dunn stayed on at Devine for nearly two decades until McAdams offered to make him partner in the business. Today, as Devine Paint Center celebrates its 30th anniversary, McAdams is getting ready to pass the paintbrush to his younger partner. “There’s a lot of new energy here,” McAdams said, standing in the recently remodeled Devine showroom on Lincoln Avenue at Main Street. A paint and wall coverings fixture in Napa for three decades, Devine Paint Center has occupied the Lincoln Avenue location since 1987. Dunn became co-owner of the paint center in 2010 and will eventually take over when McAdams retires. The recent remodeling, Dunn said, was done to make the store more attractive to the do-it-yourself customer. 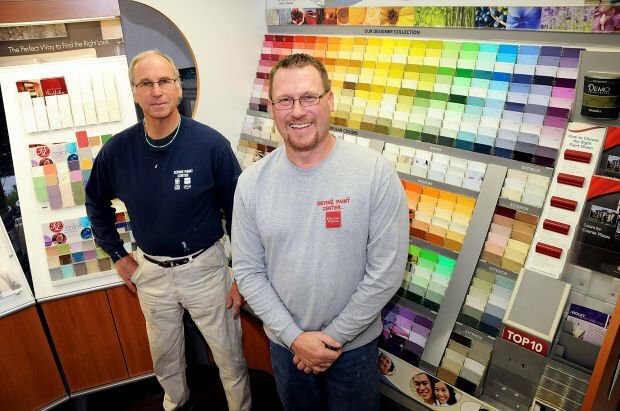 McAdams has owned the paint store since 1983, when he bought the business from Joe Devine. According to Dunn, he and McAdams recently closed a second Devine location in Wine Country Square and consolidated operations at the Lincoln Avenue store. Today, Dunn and McAdams have three employees. Dunn said about 60 percent of Devine’s business comes from professional painting contractors. And while big-box retailers represent the store’s biggest competition for the non-professional, Dunn said more do-it-yourselfers are attracted to Devine’s superior service and personal attention. 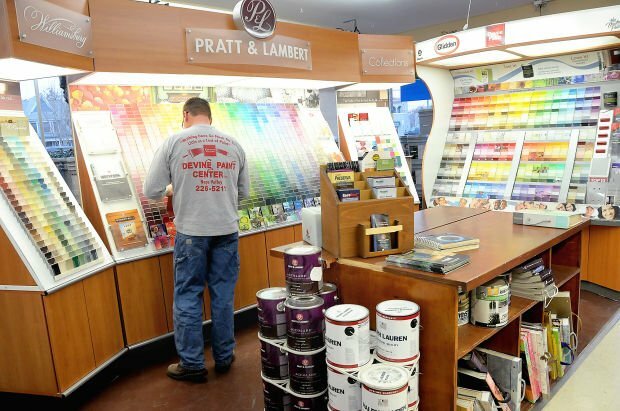 Product knowledge and paint experience, Dunn said, are among the services that add value to Devine’s quality line of paint brands that include Pratt & Lambert, Glidden, Devoe and Ralph Lauren. Dunn said that a common request is color matching for paint touch-ups or coordination with furnishings. While most of his big-box competitors have color-matching technology, Dunn said the Devine staff takes it a step further. In his three decades as a paint salesman, McAdams said he has witnessed a full palette of painting and decorating trends. McAdams said his store used to carry an extensive line of wallpaper with a large portion of the store packed with sample books. Today, just a few dusty wallpaper catalogues remain in Devine’s showroom. Easy-to-apply specialty paint finishes, Dunn said, have replaced wallpaper for those desiring a textured or unusual wall treatment. Other changes in the paint world include more durable paints that are easier to handle and more environmentally friendly, according to McAdams. Although paints have improved in convenience and durability, Dunn said that occasional painters still might be baffled by complications during repainting. Helping DIY painters solve problems, he said, further differentiates Devine Paint Center from its big-box competitors. Asked how the current economy has influenced Devine’s business, McAdams shares insight gained through his 30 years behind the paint counter. Dunn explained that home buyers commonly choose to repaint a newly purchased house as a quick, inexpensive way to add their personality and style to the home. A vibrant housing market, therefore, is healthy for the retail paint business. Spending $50 on a coat of paint for a room, McAdams said, is much cheaper than, say, replacing window coverings.